Porcellino can be described as many things: a salumeria, a wine bar, a restaurant, and a casual neighborhood restaurant. While still under the guidance of renowned chef Chris Consentino, this restaurant has a very different feel than the previous restaurant, Incanto, which occupied the same space. Even though Porcellino has the same furnishings as Incanto, the new eatery feels more approachable. The quality of the food is fit for fine dining, but groups no longer need to sit down for a 5-hour dinner at one of the elongated wooden tables. Instead, one can just pop into Porcellino, place an order, grab a number, and sit down with friends and family for a casual family meal. Porcellino also does a lot of take-out orders, which caters to the growing number of 20/30-something year old’s in the neighborhood that are happy to pay more to have someone else do their cooking for them. Just as he did with Incanto’s menu, head chef Consentino continues to specialize in cooking pork, hence the name Porcellino, which means “piglet” in Italian. Consentino also tries to experiment cooking with all different cuts of meat so that no part of the animal go to waste. Even though I am not much of a meat eater, I had to try some of the celebrated pork dishes here, and I admit that I was impressed. Despite emphasizing a porky menu, they also have a great selection of vegetarian entrées as well. For example, I tried a delicious toasted farro salad with herb pesto and sprouts. 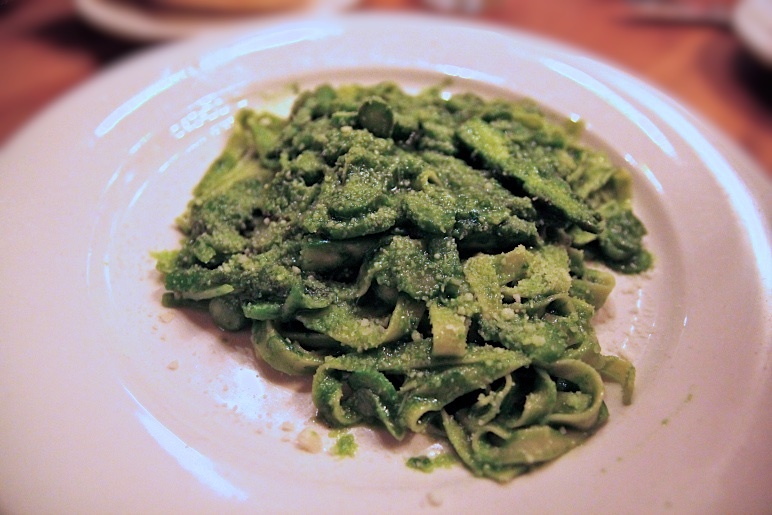 I also really like the verdant tagliatelle pasta dish coated with ramp pesto and layered with asparagus. Porcellino was a welcome addition to Noe Valley, though it closed in 2015. **Update: Porcellino closed on 11.26.14. You can still visit Boccalone in the Fairy Building to try “tasty, salted pig parts”.